Green Drinks KL: How can we compost in high rise building and landed property? Greetings from Green Drinks KL! 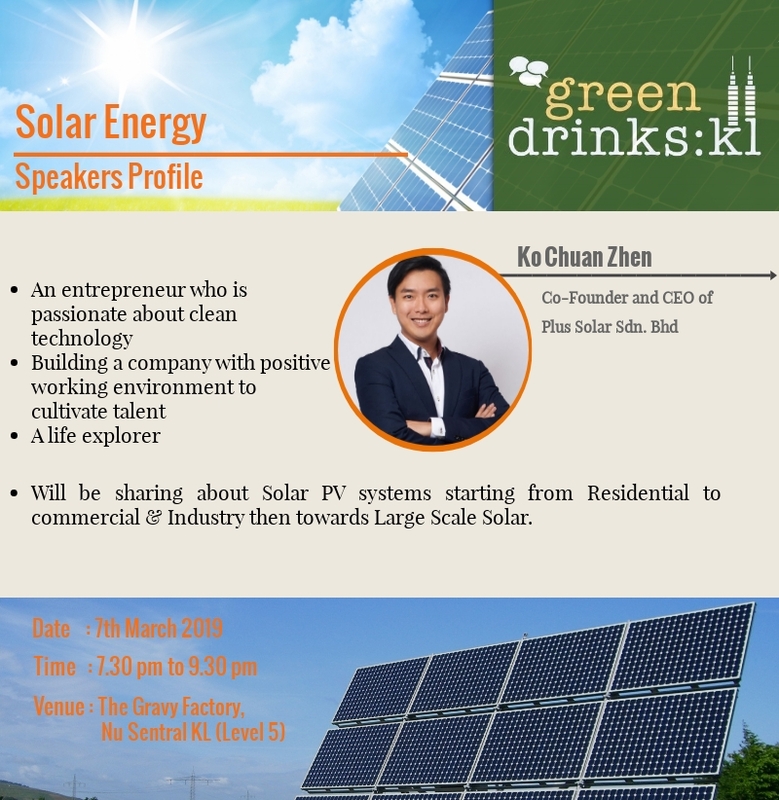 We thank you for making Green Drinks KL: Solar Energy a great success. Your enthusiasm and positive spirit have helped make our time together both productive and fun. Based on your feedback on what you wish to know in the next Green Drinks KL session, we are delighted to present to you Green Drinks KL: How can we compost in high rise building and landed property? Do you know that around 40% of waste being thrown daily is food waste? Of this, 20% is avoidable food waste. Most people throw away their food scraps or inedible food. These wastes will end up in a plastic bag and get to the landfill. But before you categorize them into waste, let's consider composting. What better way to return to the Earth than to recycle your food waste in your own space! In fact, you don't require green fingers or even a garden to compost. What’s more, it is virtually cost-free! Join us in this session, Green Drinks KL: How can we compost in high rise building and landed property?, as we share with you reasons and tips on how to compose your food waste. Theme : How can we compost in high rise building and landed property? As a way of saying thank you to The Gravy Factory for hosting us, participants are strongly encouraged to purchase at least a drink during the event. *As this is a free event, please register responsibly so that we know the estimated number of people who will be attending. Also, by verifying the registration, students will be given 20% discount for the drink and/or food you ordered, courtesy of the generous owner. Just bring your valid student card for verification, while everyone else will be given a 10% discount, courtesy of The Gravy Factory! You may cancel the registration if you are unable to make it to the event. Thank you and we hope to seeing you this 2nd May 2019! In this session, we are honored to invite Mr. Ko from Plus Solar Sdn. Bhd. He will be sharing with us about solar PV from residential to commercial and industry scale, then towards large scale solar. He too will touch a little on Malaysian policy and discuss on the possibility of achieving 20% renewable energy by 2030. As there is a high number of registration for this session, seats might not be sufficient to accommodate us all. You might need to wait a little longer for the orders to arrive. GreenDrinks KL aims to not only let you learn new things, but also to share your thoughts on it with other participants. Please do feel free to mingle around during the event. Who knows, you might meet new friends or even good connections! Thank you and we look forward to seeing you this 7th March 2019! Thank you for making Green Drinks KL: Reconnecting with Forest a fun and interactive session! We kept hearing that we are losing touch with the forest and it is a good time to hear from our sifus on what they wish to share their wise words to us. When you think of reconnecting with forest, try to think about our culture and ethnicity. Remember about our roots. Do you remember idioms like "Diam diam ubi berisi" or "Melentur buluh biarlah dari rebungnya"? Or what about our favourite kuihs like kuih talam and kuih koci? What do they have in common? They all have plants as their base. You can reconnect with forest by language and delicacy because you need to know the plant's name to create it. Next time, when you plan on creating beautiful poems or munching on your meals, try to simply look and observe what nature has given us. Observation is the starting point for you to know the plant and adopt it. Wait what? Isn't this a simple yet direct answer to how we can reconnect with the forest? Strangely enough, this is one thing that many of us are not doing. We have to remember that we are all connected with nature. We mimic the way nature works and our source of inspiration comes from the forest. Just try to listen and understand the nature. If you can do it, perhaps you can be the next tree listener. Remember, the best green action is me and the best time is now. Now, just when you think of going to the forest... what if the forest is trying to reconnect with us? Forest is a social construct where we think if it has enough trees which are green and tall enough, then it is a forest. But it need not be so. Apparently, nature and forest are more porous than we think. Just open your eyes. It is all around us and we can find it in strange places like at the road side, under the bridge and even the drain near you. Those weeds at the back of your garden might just be a forest for the insects. Simply put, reconnecting with forest is as simple as looking at how nautre behaves like a mini forest in our neighbourhood. 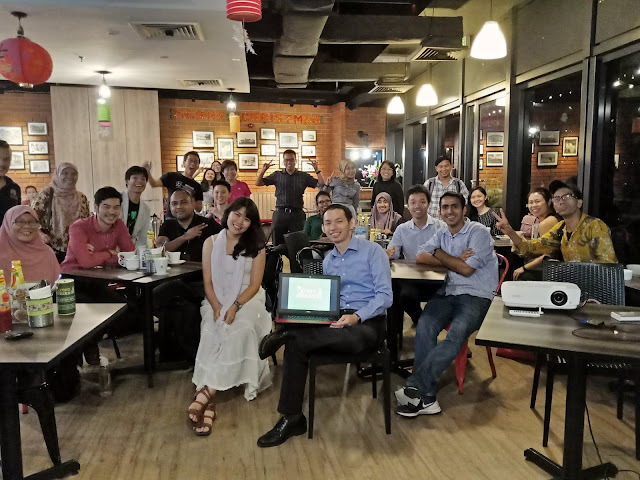 Thank you for your time in reading this short post write-up on Green Drinks KL: Reconnecting with Forest! We hope that you find back your inspiration to reconnect with the foret. Do check out our website, Facebook group and YouTube channel if you are interested in watching the session or other past sessions. See you at Bukit Persekutuan! We thank you for attending Green Drinks KL: Films & Environment! Your presence has helped to make this event a great success and your enthusiasm and positive spirit have helped make our time together both productive and fun. We hope that the session has managed to spark the creativity you to make more films. Films have managed to empower people to share their voice and allow us to fight and protect what is dear to us. Sustainable Development Goal 15 aims to "protect, restore and promote sustainable use of terrestrial ecosystems, sustainably manage forests, combat desertification and halt and reverse land degradation and halt biodiversity loss". Forests play an important role not only in our local welfare but also in meeting global objectives. Forests provide natural resources for the local communities whilst reducing the risk of natural disaster, including flood, landslide and drought. In a wider perspective, forests play an important role in mitigating climate change through carbon sequestration, contribute to the balance of oxygen, carbon dioxide and humidity in the air and protect watersheds, which supply 75% of freshwater worldwide. However, many of us tend to take the forest for granted. As part of an international community in moving toward a better future, we cordially invite you to join us in our upcoming "Green Drinks KL: Reconnecting with Forest". Follow us as we will post up more updates from time to time! We wish you all the best and hope that you continue to be engaged with Green Drinks KL. Thank you and we look forward to see you at Green Drinks KL. Green Drinks KL is a bimonthly gathering (held on *first Thursday of the month*) as an informal international networking initiative to connect environmentally minded people and professionals. It is a simple event with no formality. The main goal is to have some valuable conversations in an informal setting. See you at Green Drinks KL. Cheers! 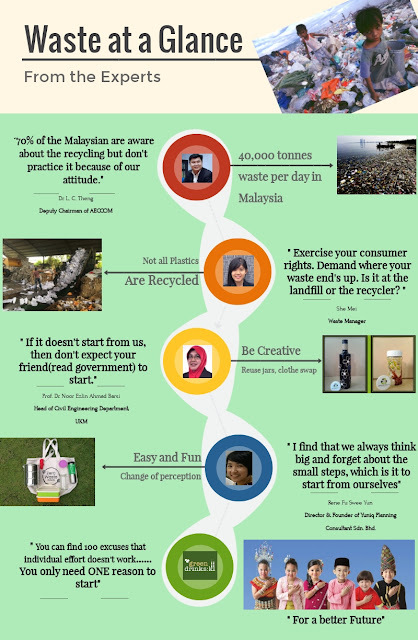 Here is a mini summary on what were discussed in Green Drinks KL: Waste Management - Views from Different Perspectives. Interested to know more? We have newly created a YouTube channel for it! If you wish to connect with more environmental enthusiasts or learn more about environmental issues, do join us for our next Green Drinks KL networking event! We thank you for attending Green Drinks KL: Waste Management – Views from Different Perspectives! Your presence has helped to make this event a great success and your enthusiasm and positive spirit have helped make our time together both productive and fun. We hope that our diverse and dynamic group of speakers were able to shed some light on the current situation and steps that can be done to manage our waste properly. Our speaker, Dr Theng has shared, based on a study done by him, 70% of Malaysian has the awareness of recycling. However, as all the speakers have agreed upon, the change of behaviour has to be started with each individual – us and do not stop once we have started. Rene Fu has stressed out that, “We can have 100 excuses that individual effort doesn’t work… We only need 1 reason to start”. And to start being green, Prof Ezlin mentioned that we need a group of people to do it together, otherwise it won’t work. As for She Mei, she reminded us to always try our best to practice our consumer rights on waste. 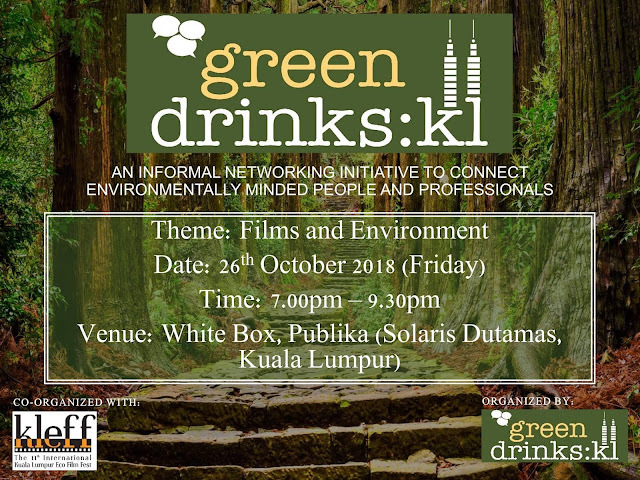 For our next Green Drinks KL, we have collaborated with EcoKnights to have our Green Drinks KL session in conjunction with the 11th Kuala Lumpur Eco Film Festival. Films with an environmentalism theme have increasingly be released to the public. Films like "WALL-E" and "Serengeti Shall Not Die" play an important role in creating awareness among the public and ultimately inspire audiences to take action on the challenges faced by our planet. How much impact has such films gives to the public? How do film makers make their message heard across? Join us in understanding more on these in the next Green Drinks KL. 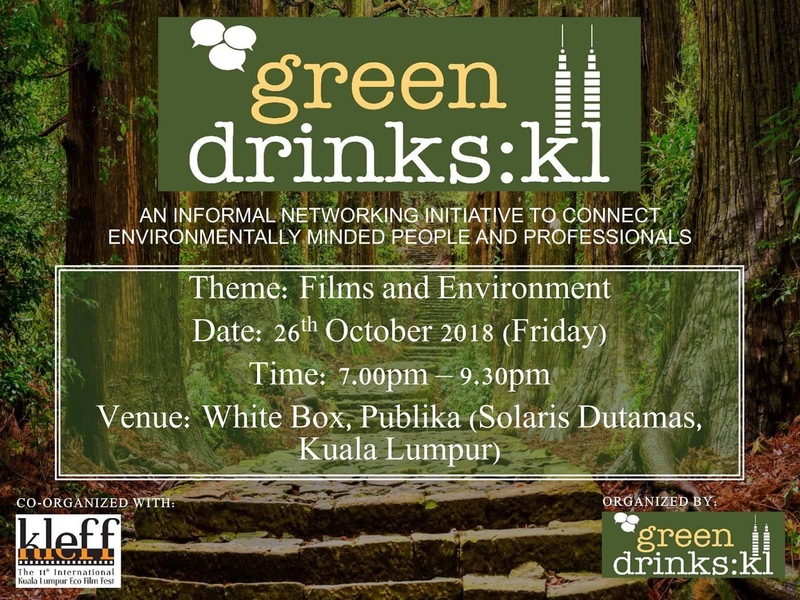 In the next Green Drinks KL, we have collaborated with EcoKnights to have our Green Drinks KL session in conjunction with the 11th Kuala Lumpur Eco Film Festival. For your information, Eco Knights is a non-profit environmental organisation that focused in sustainable community development. Every year, Eco Knights organises this festival to facilitate building a nation of ecologically conscious businesses, individuals and communities through on-ground activities and film screenings focused on critical environmental issues and stories. *Please register at Eventbrite responsibly so that we could know the estimated number of people that will be attending. Post Write-Up for Green Drinks KL : Open Mic - We want to hear from you! Green Drinks KL : Open Mic - We want to hear from you!